Believe it or not, the winter is the best season to get laser hair removal. Laser treatments are safer and more effective when the skin is not tanned. It typically takes several treatments to achieve the full effects of laser hair removal (soft, silky, smooth skin). Starting laser hair removal treatments at The Langdon Center in the winter will have you ready for skirts and shorts by springtime. 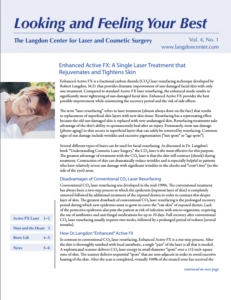 The Langdon Center uses the Vectus, the fastest and most effective laser for hair removal in the world. The Vectus laser in Guilford, CT can be used on the legs, back, bikini area, underarms, chin and upper lip. Another big advantage of the Vectus: It is the least painful of any laser used for hair removal. Laser hair removal is best to begin in the wintertime because you will need to undergo several treatments over a period of a few months. It is also best to protect the treated areas from the sun in order to get the best results possible.